Jewelry Weight Converter to Convert Carats, Grams, Troy Ounces, etc. This online conversion calculator will instantly convert between common jeweler's weight units (carats, grams, grains, milligrams, pennyweight, points, ounces, and troy ounces), plus show the math used to complete the conversion. 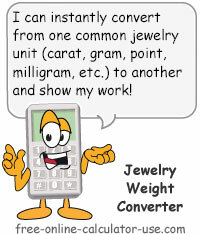 The Learn tab includes a jeweler's weight conversion table in case you would like to convert the weight units manually. Select the jewelry weight units you want to convert from. This will load the proper text and conversion formula into the converter. Select the jewelry weight units you want to convert to. This will load the proper text and conversion formula into the converter. Enter the weight units to convert from the type listed on in this line. Select the number of places you would like the "to" units rounded to. If "None" is selected, no rounding will be performed and raw values will be displayed both in the result field and in the chart. Note that you can alter the rounding of the result before or after the conversion. This is the weight units converted into the units listed on this line. Note that you can alter the rounding of the result before or after the conversion. This calculator will convert between carats (ct), grams (g), milligrams (mg), grains (gr), points (pt), pennyweight (dwt), ounces (oz), and Troy ounces (ozt). Plus, unlike other online weight converters, this converter will show the formula it used for converting as well as the step-by-step math it used to complete the conversion. If the weight units you want to convert between are not available in this specialized converter, please try the Weight Conversion Calculator, which performs the 14 most popular standard and metric unit conversions related to weight. Select the weight units you want to convert from. Select the weight units you want to convert to. Enter the number of units you are converting from. Tap the "Convert Jewelry Units" button. This will display the result of the conversion and generate a step-by-step explanation showing how the calculator arrived at the result. The following jewelry weight conversion table lists the weight conversion factors used by the converter on this page. To convert from one weight to another using the above table, find the weight you are converting from in the left-most column. Next, find the column heading you want to convert to, and take note of the factor that's in the same row. Finally, simply multiply the number of "From" units by the factor where the two weights intersect. To illustrate, if you want to convert from 10 carats to grams you would find the "carats" row in the left-most column and note the factor listed on the same row in the "grams" column. There you will see that 1 carat is equal to 0.2 grams. Finally, multiplying 10 (carats) by 0.2 (grams) tells you that 10 carats is equivalent to 2 grams.